At least one out of every seven early voters in Dallas County has had to sign an affidavit verifying his or her identity as part of Texas’ new voter ID law. Though no one in Dallas County has been prevented from voting — or even forced to cast a provisional ballot — because a name discrepancy, officials said women are being especially impacted by the requirements. And Toni Pippins-Poole, the county’s elections administrator, said the totals through the first five days of early voting for the Nov. 5 election are a conservative estimate of the potential inconvenience. In Dallas County, more than 6,800 people from Oct. 21-25 voted early in an election that features nine proposed constitutional amendments. And at least 1,020 of those voters signed the affidavits before they voted, officials said. The affidavits total is being hand counted, and officials haven’t been able to get reports from every polling location. So while Pippins-Poole anticipates there are many more instances, she said she won’t likely know for sure until the election is over. Pippins-Poole said, however, that the name requirement appears to have a greater impact on women, who are more likely to change names after getting married or divorced. Many women, for instance, take on their maiden name as a middle name. With even some high-profile women — including Democratic gubernatorial candidate Wendy Davis — being forced to sign an affidavit to vote, Democrats have pounced on the issue as an example of voter intimidation against minorities. Election officials are taking pains to minimize the hassle. At polling locations in Dallas County, voters also have the option of updating their information in the voter registration database so it matches their photo identification going forward. But at the least, there’s an extra minute or two of inconvenience for some voters. That might not a big deal in a low turnout election, but Pippins-Poole is already planning to add staff for the bigger primary and general elections next year. “When you have a huge turnout, a minute for every voter could really produce some lines,” she said. One person who had to do the affidavit thing was Sen. Wendy Davis. Davis, D-Fort Worth, is listed as Wendy Russell Davis on her driver license and as Wendy Davis on the voter registration rolls, said spokeswoman Rebecca Acuña. She signed an affidavit and cast an actual ballot, not a provisional one, Acuña said. A provisional ballot requires a voter to come back later with appropriate ID. Democrats have voiced concern in recent days that women could be particularly affected by the new Voter ID law because they may have different names on their identification versus registration. They are making a push for women’s votes as Davis is expected to face Republican Attorney General Greg Abbott in the 2014 general election. But if the listed names are substantially similar, voters must simply attest that they are the same person, said Alicia Phillips Pierce, communications director for the Texas secretary of state. 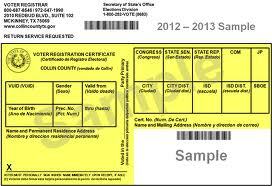 Sen. Leticia Van de Putte, whose registration is still in her maiden name, had to do the same. Sen. Davis sponsored the amendment that allowed for “substantially similar”ly-named voters to sign an affidavit instead of having to cast a provisional ballot. Imagine what the uproar would be like right now if that amendment had been voted down. Not everyone affected by the differences in how their names are represented are women. One man who had to sign an affidavit was none other than voter ID fanatic Greg Abbott. Attorney General Greg Abbott, the Republican who’s expected to get the party nod to face the Democratic senator next year, also will have to attest to his identity when he votes, according to campaign spokesman Matt Hirsch. That’s because, like Davis, Abbott has a different name on his driver license than that on the voter rolls. On his driver license, he’s Gregory Wayne Abbott, Hirsch said. In the voter registration file, he’s simply Greg Abbott. How wonderfully ironic it would have been if Greg Abbott had been forced to cast a provisional ballot. And who does he have to thank for avoiding that ignominious fate? I hope Davis reminds him of that at any debates Abbott deigns to agree to. Eh, what’s a few thousand mis-identified non-citizens among friends? I am not sure what procedure the Dallas Elections board is using, but locally, all that is required is for the voter with slightly different names to check a box next to the signature in the poll book. I cannot imagine how that would slow down the line significantly. Once the voter has done this, his next voter registration will match his drivers license or other ID, so with each successive election there should be fewer and fewer such mismatches. I am not sure what procedure the Dallas Elections board is using, but locally, all that is required is for the voter with slightly different names to complete the “affidavit” is to check a box next to the signature in the poll book. I cannot imagine how that would slow down the line significantly, or take one or two minutes per voter. Once the voter has done this, his next voter registration will match his drivers license or other ID, so with each successive election there should be fewer and fewer such mismatches.